You’ll be transfered by coach from Strasbourg to Remich, where you’ll board our ship at 6 p.m. After comfortably settling into your cabins, we’ll introduce our crew at a welcome cocktail. Join us for an evening of entertainment. This afternoon, join us for a visit to a winery complete with a tasting*. We'll return to the boat and begin to cruise to Saarburg. Join us for an evening of entertainment. 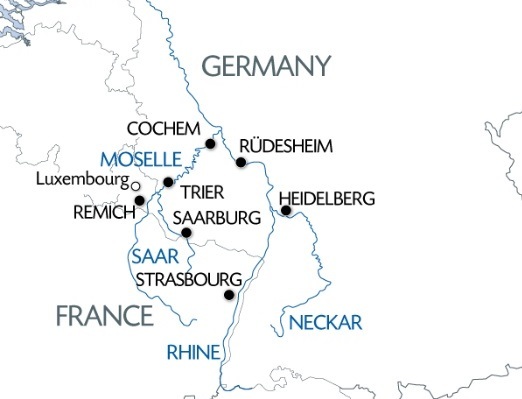 We’ll spend the morning cruising on the Sarre and the Moselle towards Trier, arriving by late morning. This afternoon, join us for a guided tour of Trier. After we return on board, we'll begin to cruise to Cochem. Join us for an evening of entertainment. We’ll arrive in Cochem early in the morning. Join us for a guided tour of Cochem Castle. The afternoon will be spent cruising the Moselle River towards Koblenz. Once we arrive at the end of the afternoon, explore the city with our host or hostess. The rest of the evening is yours to do as you please. This morning, we’ll pass through the beautiful and romantic Rhine Valley. Our ship will arrive in Rüdesheim by late morning. In the afternoon, join us for a guided tour of Rüdesheim. We'll arrive in Mannheim early in the morning. This will be our starting point for the excursion to Heidelberg. The afternoon will be spent cruising along the Neckar and Rhine Rivers towards Strasbourg. Tonight is our festive gala evening.